Defeat of Islamic State in Raqqa may herald wider struggle for U.S. 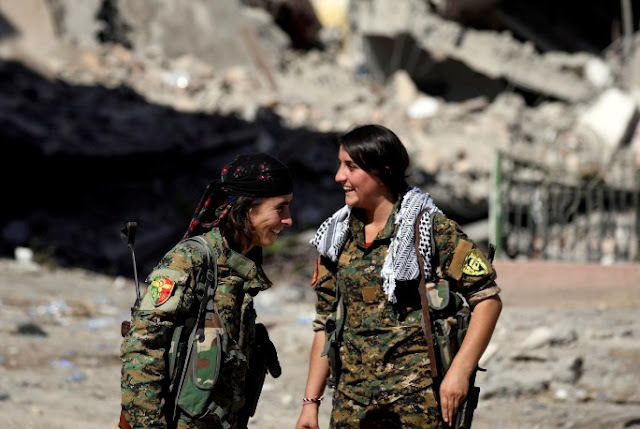 Female fighters from Syrian Democratic Forces (SDF) react in Raqqa, Syria, October 16, 2017. WASHINGTON - The defeat of Islamic State in its de facto capital Raqqa may only be the start of a wider struggle by the United States to contain any insurgency launched by the militant group and to stabilize the region, as Washington struggles to define a comprehensive strategy in Syria. U.S.-backed militias declared victory over Islamic State in Raqqa on Tuesday, raising flags over the last jihadist footholds after a four-month battle. The Sunni militant group often referred to as ISIS, overran Raqqa in January 2014, seizing control from rebel factions opposed to the rule of Syrian President Bashar al-Assad. Raqqa was the first big city Islamic State captured, before its rapid series of victories in Iraq and Syria brought millions of people under the rule of its self-declared caliphate, which passed laws and issued passports and money. Islamic State has lost much of its territory in Syria and Iraq this year, including its most prized possession, the Iraqi city of Mosul. In Syria, it has been forced back into a strip of the Euphrates valley and surrounding desert. Middle East analysts said that among the wide array of problems exposed after Islamic State’s ouster from Raqqa were where to find money to help rebuild the shattered city, how to support fledgling local government in the face of a likely insurgency and how to keep Assad, backed by Iran and Russia, from trying to regain control. “The real challenge is that ISIS will turn into a vengeful ghost, will try to stalk and to wreak havoc on the post-conflict security and governance and administration in order to undermine the U.S. and its partners,” said Nick Heras of the Center for a New American Security. Assad’s use of force to crush an initially peaceful uprising against his family’s more than four-decade rule triggered the country’s civil war in 2011. The conflict helped create a vacuum that Islamic State eventually filled by seizing parts of Syria. Russia stepped in with military support for Assad in 2015. “The greatest challenge for Raqqa and local Syrian partners that are trying to rebuild Raqqa is the ambiguity of Trump administration Syria policy,” Heras said. “A signal needs to be sent that the U.S. intends to keep a residual force in the areas that it has conquered from ISIS in order to oversee the stabilization mission and to have the broader, publicly unstated aim, to constrain Iran’s ability to reconquer all of the country in the name of Assad,” he said. Several analysts said the United States does not appear to have a durable strategy to stabilize the region, let alone to revive the moribund U.N. talks in Geneva aimed at ending the civil war. Saab, of the Middle East Institute, suggested U.S. influence in Syria may be too slight to shape events. Muslim Global: Defeat of Islamic State in Raqqa may herald wider struggle for U.S. The defeat of Islamic State in its de facto capital Raqqa may only be the start of a wider struggle by the United States to contain any insurgency launched by the militant group and to stabilize the region, as Washington struggles to define a comprehensive strategy in Syria.